There are several webcam services available that specialise on snow reports and live images from skiing areas in Austria. 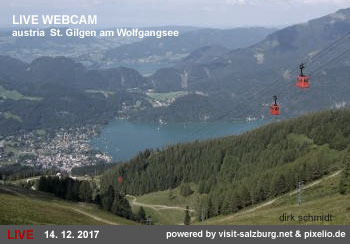 Several of them operate webcams in the ski ressorts of Salzburg, of which St. Gilgen am Wolfgangsee is among the most important. This article highlights some "snow cams" from St. Gilgen and its immediate surroundings that we found particularly useful. St. Gilgen Webcam: The Yacht Club of St. Gilgen has its own website with a webcam that is pointing at the Wolfgangsee, one of the most scenic lakes in the Salzkammergut. Bergfex St. Gilgen Webcams: The website bergfex is a travel site dedicated to the Alps and mountainous activities. This link takes you to their overview on webcams from St. Gilgen and surroundings; the main camera pointing right at the central Mozartplatz square. St. Gilgen seen from Hotel: A website of a local hotel that has a website which gives a panorama view on the Schafberg, the town of St. Gilgen itself and Lake Wolfgangsee. Panorama of St. Gilgen & Wolfgangsee: Panoramablick collects webcams from all over Austria; in this case, you see the town of St. Gilgen alongside with Lake Wolfgangsee. It is only one of several webcams from the area, there are a few from nearby Strobl available, too. Wolfgangsee Webcam, not St. Gilgen: The Weißes Rössl is a famous hotel at Lake Wolfgangsee; its website has two webcams which show the lake, but since the hotel is situated in St. Wolfgang, nothing of St. Gilgen in the strict sense of the world can be seen here.